Malaysia's Leong Jun Hao gave himself a big boost for the World Junior Championships in Jogjakarta in October when he won the Badminton Asia Junior title in Bintaro, Jakarta on Sunday. 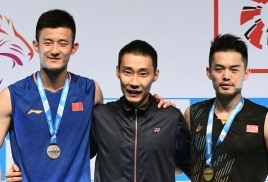 The Malaysian Under-21 champion, however, had to come through a gruelling three game 74-minute battle for his 21-6, 20-22, 21-17 win against China's Bai Yupeng, in a match he would have wrapped up in straight games. Jun Hao was the master in the first game as he rattled the Chinese with all round performance. Yupeng, playing in his first international meet, was totally lost in the game but regained his composure in the next two to give the Malaysian a run for his money. "It does not matter to me now how I won. 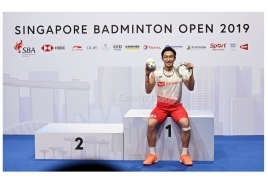 I am happy to win the title for Malaysia after years," said Jun Hao, adding that he was in a hurry to win the second set. "Winning the Asian junior title is a big boost for my confidence. Hopefully, it will serve me well in the world junior...as I aim to add the world junior title." The Malaysian flag was raised and the national anthem, "Negara Ku", was heard at the stadium for the first time. Meanwhile, losing the mixed team title took a back seat for China as they flexed their muscles in the individual finals - winning the boys' doubles and the girls' singles for their first two titles of the day. Unseeded Di Zijian-Chang Wang pulled off a stunning straights games 21-19, 21-11 win over second seeds Lee Sang-min-Na Sung Seung of Korea in 35 minutes. China's national anthem was also heard and the flag raised for the first time at the stadium - a motivating factor for Han Yue when she took the courts for girls' final against third seed Pattarasuda Chaiwan of Thailand. The unseeded Han Yu stopped the Sea-Games bound Pattarasuda in her track with a 21-15, 21-13 win and stopped the Thai from adding the Under-19 to her list after winning the Under-17 title last year - also in Jakarta. However, the Koreans forced China into a "pit stop" when third seeds Baek Ha-na-Lee Yu-rim ran away with the women's doubles title with a 21-12, 21-19 win against China's Liu Xuanxuan-Xia Yuting in 40 minutes. In the final event of the day Indonesia too celebrated - winning the mixed doubles title in a thrilling 65 minute match which sent the home fans wild. The fifth seeded Indonesian pair Rehan Naufal Kusharjanto-Siti Fadia Silva Ramadhanti dashed Korean hopes, third seeds Na Sung-seung-Seong Ah-yeong with a 21-19, 19-21, 21-9 win for the title. Earlier Korea had won the mixed team title with a 3-2 win over Indonesia in the final.